EV SSL 123 is a collection of articles and tutorials compiled to make the process of choosing, obtaining and installing your Extended Validation SSL Certificate easier. If you’ve considered purchasing and installing a EV SSL Certificate but aren’t sure you understand the features, benefits and limitations, this site is for you. We’ve gathered relevant articles from all over the web, as well as written from our own experience and research to give you a single site that has everything you need to know in just one place. Whether you’re selling items online or collecting data that requires the high security protection, this site is for you. Disclaimer: EV SSL 123 is not the legal property of VeriSign, Thawte, GeoTrust, GoDaddy, Comodo or GlobalSign. All advice given here is given with no warranties as to it’s suitability or accuracy and no guarantees are offered or should be implied. 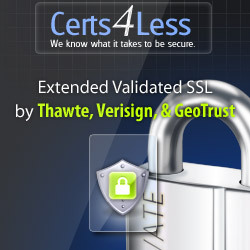 Please visit the website of the Certificate Authority for further information.